Voidguards are all the same. “I’m afraid I can’t do that,” she said. She shifted, extending her arm and aiming her witchblade at his throat. The Voidguard clearly had some kind of fencing experience, though she hadn’t seen any fencing school that integrated firearms. On the other hand, all she knew about blades was how to direct the point at the opponent and drive it in. She didn’t even like blades, and the only reason she’d grown her witchblade was because she suspected Simon would have neutralized her long-distance magic. The Voidguard kept his arms high, almost like a boxer. His soulblade was made entirely of quintessence. It brimmed with energy, yearning to release it all in a single flash. And he had more quintessence on him, too. Spare ammunition, it seemed. If she had to take him, she would fake high, fake low, buying time to launch a dart of detonation. And she had to strike first. “I have my duty, hexe,” she said. ...And yet, he didn’t have to warn her. Warn the coven. “Why did you warn us?” she asked. “And?” she asked, also taking another step back. 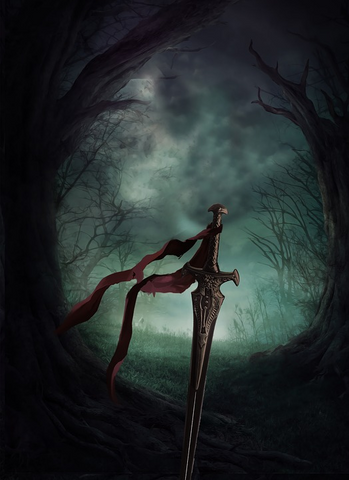 The soulblade glowed and shrank, collapsing into a fist-sized lump. She sent a touch of entropy through her, breaking down her withblade and scattering it to the winds. Very, very slowly, she eased it off her shoulders and set it on the ground. She noticed that he stooped over and picked up his pistol. As she unzipped it he fumbled with the weapon, uttered a soft curse, and holstered it. She opened her bag and stepped back, letting its contents glow. She retrieved her bag, and together they headed for the paling-tower. She sipped a little more ambrosia, just enough to maintain her Dark Vision. She kept her head on a swivel, watching for signs of the Fallen. None. She heaved a soft sigh of relief. The paling-stone hadn’t been gone for too long. “Are you alone?” she asked. The paling-tower was in the heart of the necropolis. It was a stone obelisk covered in inscriptions. At eye level on every side was a hexagram. She’d read in old books that witches shunned holy symbols. She found that both sad and hilarious; some witches she knew incorporated the hexagram into their own practices. The access hatch to the paling stone was locked. Beringer placed a small aethertool up against the lock. In moments it transmuted into a key. He unlocked the hatch and opened it. Kentaris retrieved the paling-stone, and very carefully set the giant crystal on the receptor within the tower. When the paling-stone was in position, the hexagrams glowed a pure, brilliant white. In her dark vision, a curtain of white descended upon the area, washing away the presence of death, replacing it with a calm serenity. Out the corner of her eye, she caught Beringer staring at her. They trudged to the direction of the exit in silence. The Voidguard maintained his vigil, watching every nook and cranny. His vision was enhanced like hers, but in a different way. The energies within him were a raw, roiling, chaotic mess that sought to convert everything into itself. It was what the Church called the Void, she supposed, and not so different from the Fallen. In the face of naked evil, what were differences in dogma? “What’s your number?” he asked.